ROCKWOOD, Colo. — Debbie Burns' 55-year-old knees are quivering as much as the aspen trees that blanket the surrounding San Juan Mountains. But to Burns, perched at the edge of a two-story-high platform wrapped around an old-growth ponderosa pine, her grandson's happiness trumps an aversion to heights so acute she once had to be shoved off a chair lift. So after watching 11-year-old Colby Moe swoop down the first of nearly two dozen steel ziplines strung across the Tall Timber Resort in southwestern Colorado, the vacationer from Bakersfield, Calif., takes a deep breath — and her own 72-foot-long leap of faith. Oh, my gravy!" Burns yells, accepting a congratulatory hug from Colby after gliding to a graceful stop at the next tree. "Now, can I stay here and keep doing the bunny-hill version?" Transcending fear is part of the fun at Tall Timber's Soaring Tree Top Adventures. Opened four years ago and tagged by TripAdvisor.com as the USA's most popular attraction based on reader rankings, it's a leading example of a high-wire act that's taking off like Tarzan. The adventure of strapping into a harness, clipping to a cable, then zipping across a canyon, down a mountain or through a canopy of trees — hence the terms ziplining and canopy tours — was popularized in Costa Rica a decade ago. Now, the elevated excursions are cropping up across the USA, with at least two dozen in operation and dozens more in the works. Some, like an Alaska zipline that whisks cruise ship passengers more than 1 mile in 90 seconds, are aimed at adrenaline junkies. Others cater to families wanting to both scream and savor the scenery. 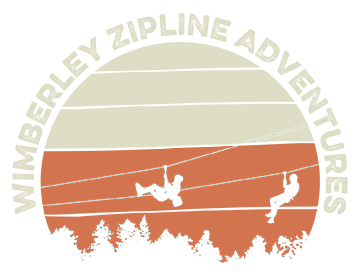 Many canopy tours let participants "connect with nature and each other in an otherwise inaccessible environment," says John Walker of Bonsai Design, a Grand Junction, Colo.-based company that has designed seven U.S. zipline courses over the past three years. That mission certainly applies to Soaring Tree Top Adventures. Tall Timber owners Denny Beggrow and his son Johnroy created the 5½-hour aerial tour as a way to broaden their remote, 180-acre retreat's appeal. Inspired by Johnroy's childhood treehouses and Sean Connery's rain-forest adventures in the 1992 film Medicine Man, their tour rapidly eclipsed such offerings as fly-fishing and horseback riding among wealthy patrons that have included CEOs, movie stars and vice presidents. As of this summer, the Beggrows' 10-room resort — accessible only by helicopter or the Durango & Silverton Railroad — no longer accepts new overnight guests. But as many as 60 people a day pay $329 a piece to clamber aboard the steam-powered train in Durango, spend two hours gaping at vistas captured in Butch Cassidy and the Sundance Kid, and get off at Tall Timber to enter a world worthy of Peter Pan and Frodo Baggins. The unregulated canopy tour industry suffered a high-profile black eye this spring when an American vacationer plummeted to her death from a zipline on the Caribbean island of Roatan, Honduras. At Tall Timber, would-be soarers must sign an alarmingly detailed liability waiver that flags the activity's uninsured status and notes such possibilities as slamming into or missing a platform, falling from 100 feet and becoming "sick from the swinging motion." But Soaring Tree Top Adventures' personable "sky rangers," all of whom have 40 hours of wilderness first-aid training as well as climbing and rappelling skills, emphasize the safety of both people and trees. An initially apprehensive Burns hangs on every word as 24-year-old Simon Richardson describes the resort's equipment, from padded, full-body Petzl harnesses designed for search-and-rescue workers to helicopter-grade, stainless-steel cables and locally manufactured platforms that hug 300-year-old pine trees without invasive bolts. A patented braking system, Richardson explains, uses a formula based on distance between platforms, wind speed and angle of descent that eliminates the need for riders to slow down by grasping the cable with a leather glove. The 28-platform course is designed to ease fears by starting out with shorter spans at lower heights, and Burns and her fellow adventurers soon focus less on carabiner and pulley mechanics than on the magic of flying through a tunnel of aspens and crisscrossing above the churning Animas River, swollen with spring snowmelt. Between whoo-eees and waa-hoos, there's plenty of time to take deep whiffs of the ponderosas' vanilla-scented bark, munch on homemade cranberry bars and keep an eye out for wheeling ospreys and the occasional black bear. Flailing legs and twisting torsos are encouraged on most of Soaring Tree Top Adventures' 1.2 miles of cable, with many guests turning topsy-turvy on longer runs. By the end of the afternoon's airborne explorations at an elevation of 7,550 feet, some are winding down. Burns, the newly intrepid grandmother, is not among them. She had resisted — and conquered — a morning maneuver that required her to step off a platform and drop straight down 30 feet, learning to trust the guides and her harness. As for the soaring itself, she realized her smooth swoops had less in common with skydiving or roller coasters than with Johnny Weissmuller's moves in the Tarzan movies she loved as a child. In mid-July, the resort will answer repeaters' clamoring for "bigger, faster, longer" with a new 1,400-foot-long span that starts after a 15- to 20-minute uphill climb by foot and zooms riders across the Animas River in about 45 seconds. As a sky ranger rhapsodizes about the views, the same woman who had to be pried off a chair lift turns to her grandson with a grin. "Now that," Burns says, "would be worth coming back for."